This spaghetti dish, meaning "whore's spaghetti" in Italian, consists of a salty, spicy tomato sauce that proves a nice variation from the traditional marinara. 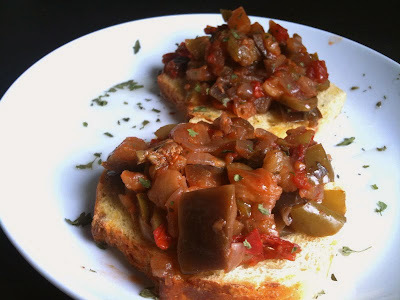 It is usually made with anchovies, but I omitted them for this recipe. Buon appetito! In a saucepan on medium heat, sauté the onion and garlic in the olive oil for 10 minutes or until the garlic had just reached golden. Add the salt, pepper, sugar, diced chili peppers, olives, capers, and grated tomatoes and keep on medium heat for 15-20 minutes or until the sauce has thickened. Serve on spaghetti noodles and sprinkle fresh parsley on top.